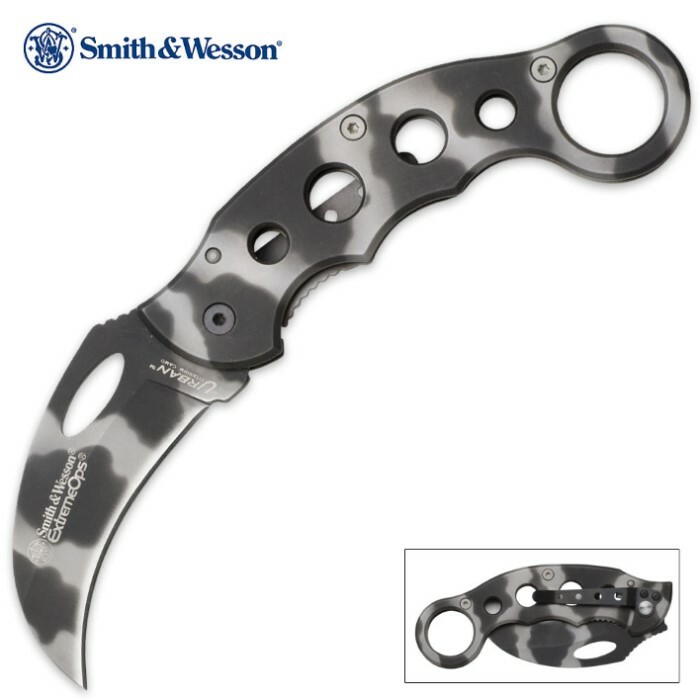 Smith & Wesson Extreme Ops Karambit Camo Folding Knife | BUDK.com - Knives & Swords At The Lowest Prices! This ergonomically designed Smith & Wesson liner lock is designed for ultimate control and cutting power in any situation. I thought Smith & Wesson is a gun company, how did they mess up on a simple framelock knife? 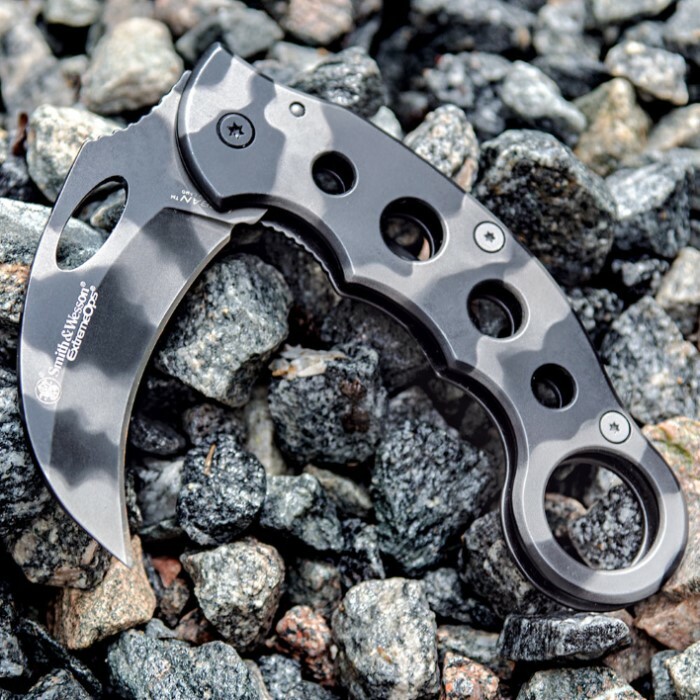 There's SOOO much vertical & side-to-side blade play, this karambit is almost impractical! It rattles a lot. The only reason I didn't give it 1 or 2 stars is because the 440C steel is actually really good so I may salvage that to create my own mini kama or scythe or something like that. Maybe I got a lemon? Darn. 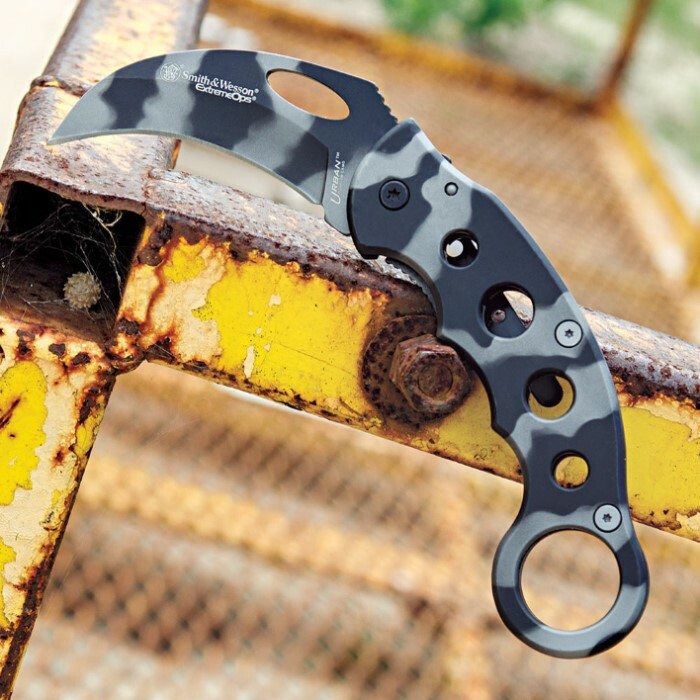 This is an excellent karambit, it is small, easily maneuverable, and fits my hand perfectly. I can not think of a better deal for the money. The knife is very easy to open, especially with one hand (use your thumb on the side of it and slide it up). It's not bulky but nor is it small, it is the perfect size for anyone and anything. Great for opening packages (and scaring your siblings). If there was a time that I would have to use it as self defense, I would surely be in good hands. The knife also has a pocket clip, that way it stays safe and secure within your pocket. Highly recommend! The knife is very well made and tight. It has a nice weight to it for the size. That being said the size is very nice. I am a 6'4 245lb man and it fits my hand very well (both forward and inverted grip). I used it at work and it is very useful for cutting pallet wrap/ straps. It also cuts through cardboard like butter. I try to be discreet with it simply because of the inherent menacing look of karambits, even though it has been very useful for very practical purposes. Hopefully I'll never have to find out, but should I need to use it for self defense, it feels as though it would be an excellent tool for the task. The look of it would be daunting for all but the most intrepid attackers. Again, I am a 6' 4" 245lb ex football player/ boxing enthusiast and if a 100lb woman pulled this thing on me I'd run for it. One tip: USE THE POCKET CLIP...it opened in my pocket once but I'm still giving it 5 stars because it was due to me being a reckless idiot. Amazed by the quality of this very affordable knife. I love this Karambit !!! MUST BUY MUST BUY MUST BUY you get the picture . This knife comes very sharp right out of the box. I was actually able to shave my arm with the knife. Intimidating looking and a well made knife for sure. I bought 5 karambits and some of them are more expensive than 80 dollars, but I am proudly announcing that this one is the best one ! Feels like a 100 dollar knife and is razor sharp 10/10 would buy again. The other Smith and Wesson Kerambit is one of my favorite knives so had to try this one as I prefer the blade curve on this model. Once the blade is open the knife is fantastic. Lost one star because it is much slower to open and close. Hopefully more breaking in and tinkering will sort it out because this is a knife that I want to love, but as is I only like it. I can open it one handed, but there is enough drag on the action that I can't "flick" it I have to pivot it all the way open with my thumb. It is also fairly difficult to release the liner lock to close but I definitely prefer that to one that closes when you don't want it too.